May 31st is fast approaching and we are already halfway through this year’s spring session. So far, we voted to fix the $1.6 billion gap in the FY15 budget, started negotiations for the FY16 budget, and worked to get important legislation heard and passed out of committee. From this point on the House is scheduled to be in Session every week up until the May 31st deadline. 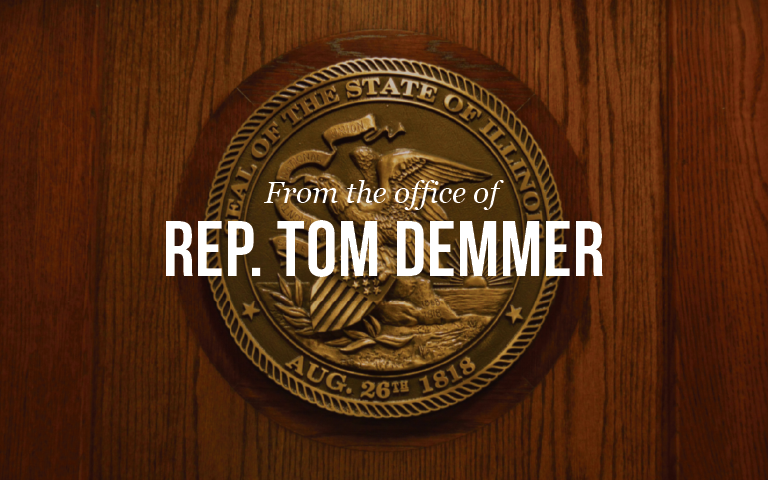 While there have been rumors of session extending into summer, it is my hope that we can pass a balanced bi-partisan budget to aid Illinois’ fiscal problems by the required deadline. I encourage everyone who has a question or concern to contact my office. It’s important that I hear from you so I may represent our district equally as I vote on important legislation. Budget Gap & FY16: The Illinois House and Senate took a tough, but necessary vote to fix the $1.6 billion gap in the FY15 budget. The bill passed with bi-partisan support and was quickly signed by Governor Rauner. If immediate action had not been taken, the State would have been unable to make payroll at prisons, low-income working families would have lost their child care assistance, court reporters would have been laid off, and money for services for the mentally ill and the developmentally disabled would have run out come April 1st. In addition, inaction would have further delayed and perhaps jeopardized critical categorical school funding. While education takes a minor funding reduction, the Governor will have discretionary funds available to ease the burden on schools that can least afford these cuts. Granting emergency budget authority to the Governor is not without precedent, and given my faith in Governor Rauner and his commitment to holding the line on spending, lawmakers believed this was the right thing to do. The House Revenue and Finance Committee heard testimony for the spending period that will begin on July 1, 2015. The FY16 budget will be affected by the actions former Governor Quinn ordered State Agencies to take. The “temporary tax” of 2011 was set to expire and did this past January. However, Quinn promised the money would still be there and the tax increase would become permanent. Estimates show that the State’s cash intake from the income tax hike is dropping by nearly $5 billion over the two-year period starting in FY14 and leveling off in FY16. This matches the two-year period marked by a drop in the State’s personal income tax rate from 5.00% to 3.75%. FY16 budget negotiations have begun and will continue to be discussed as the May 31st deadline approaches. House Committee Deadline: House committees advance 512 bills to the floor. Including action in “committee deadline week,” which ended on Friday, March 27, the Illinois House advanced 512 bills from committee to the House floor in the 2015 spring session. After the conclusion of the two-week “Easter break,” the House and its committees will consider floor action and amendments to the House bills that advanced out of committee. The House will also start looking at bills coming over from the state Senate. Heroin Crisis: A heroin epidemic outbreak has reached the Northwest region of Illinois and right here in the 90th District. Legislation to combat the epidemic has reached the House floor. House Bill 1, as amended by House Amendment 1, contains language to push back against soaring overdose rates of heroin and prescription opiates being seen by law enforcement and medical professionals. A key element of the bill is a series of measures intended to make it more difficult for patients to present large prescriptions of opiate painkillers to a pharmacy. Current research indicates that vials of prescription opiates, after being dispensed in good faith by a pharmacy, are sometimes resold on the street to addicts. One way to discourage this conduct is to further scrutinize the medical care granted to patients, to move towards objective pain assessments, divert eligible patients into other pain-management pathways, and to dispense only a few pills at a time to patients with treatment-resistant pain conditions. House Bill 1 contains measures to authorize pharmacists to dispense an opioid antidote and appropriate administration device without a prescription. Several states, such as Minnesota and Vermont, have distributed injector kits of anti-overdose opioid antagonists, such as Naloxone, and fatality rates from opioid overdoses have dropped in these states. Should HB 1 become law and the requisite kits purchased, advocates say lives could be saved in Illinois. Medical Cannabis: Card applicants top 2,500; challenges remain. The Illinois Department of Public Health told the Belleville-News-Democrat on March 23 that the Department has received more than 2,500 requests for cards that will enable the holder to enter a permitted dispensary and purchase medical cannabis. The Department has walked many of these applicants and their physician care providers through the complex application process and has mailed out approximately 1,600 approval letters. However, as of March 2015, no dispensaries have opened to legally sell cannabis in Illinois. Tornado Relief: Last week, our area and surrounding communities were devastated by a deadly tornado that took the lives of two people and left many without homes. Thank you to the first responders, volunteers and those who have donated to help provide relief for the families affected. I was overwhelmed by the generosity and kindness our community has shown. It’s tragic, but it’s times like these that really show what it means to be a community. Thank you to everyone who has donated their time and effort to help our community. Coffee Talk: I will be hosting a coffee talk on Saturday, April 18th at the Rock River Center, 810 S. 10th Street Oregon, Illinois. Coffee will be provided as we discuss legislative issues and questions you may have. Discussions will begin at 8:00AM and end at 9:00AM. No registration is needed. Please contact my office with questions or click on the link below for the flyer.